How did the blessed virgin mother of Jesus become the adulterous whore of the Catholic Church? 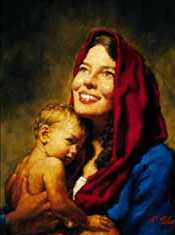 Jesus' mother was simply a godly young woman, whom God chose to be the earthly mother of the man, Christ Jesus. Although Mary was certainly blessed amongst women to be chosen for such a high calling, she was no different than any other Christian woman. Mary was a sinner. Mary was Nothing. Catholics elevate her to godhood status, but she died a sinner's death as do all mankind. Romans 3:23 clearly states, “For all have sinned...” This includes Mary. The only exception is Jesus Christ, because there are multiple Scriptures in the Bible teaching us that Jesus was without sin (2nd Corinthians 5:21; Hebrews 4:15). How did the blessed virgin mother of Jesus become the behemoth monster of the Catholic Church? Ironically, the very same Bible which Catholics claim to believe condemns them. Most of the main doctrines taught by the Catholic Church cannot be validated from the Bible. Catholics make the Word of God of "none effect" through their sinful traditions which worship Mary as a god. Catholics are a deceived bunch, who say they do not worship Mary, while reciting Rosaries to her, praying to her and asking her for divine intervention. In a standard Rosary recital, the worshipper says 53 "Hail Marys"! It is clear that Catholics have deceitfully redefined the meaning of "worship." Any dictionary will tell you that worship means "showing religious devotion." 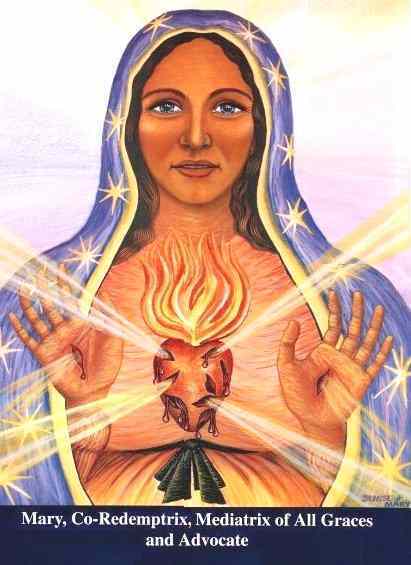 Catholics love, adore, praise and show extreme devotion to Mary, Mary, Mary. The blessed virgin has been turned into an adulterous whore by the traditions of men. I say "adulterous whore" because one billion Catholics in this world are committing spiritual immorality every time they praise, adore and show affection to Mary. Isaiah 42:8 clearly states: "I am the LORD: that is my name: and my glory will I not give to another, neither my praise to graven images." God will NOT share His glory with anyone. Only God is worthy of such praise and adoration. We read in Exodus 20:4-5, i.e., the 2nd of the Ten Commandments, "Thou shalt not make unto thee any graven image, or any likeness of any thing that is in heaven above, or that is in the earth beneath, or that is in the water under the earth: Thou shalt not bow down thyself to them, nor serve them: for I the LORD thy God am a jealous God..." God is a jealous God, who is angered when humans give praise and glory to someone else, such as Mary. Exodus 20:4,5 couldn't be any plainer—we are not to make a graven image of anything or anyone, and we are forbidden to bow to them! Who Is The Great Whore Of Revelation 17:5? I do NOT believe that the Catholic Church is the Great Whore of Revelation. Certainly, Catholics have turned the Biblical Mary into a monster, teaching something far beyond the Bible. I believe that The Great Whore which fornicates with the kings of the earth (Revelation 18:3) are the architects of the New World Order, aka, the Illuminati, or the Globalists. The kings (rulers) of the earth have sold out (surrendered) to the global elite. Nations who don't go along are persecuted and even overthrown by military coups and civil war started by the Globalists to divide and conquer their enemies. Revelation 2:9, “I know thy works, and tribulation, and poverty, (but thou art rich) and I know the blasphemy of them which say they are Jews, and are not, but are the synagogue of Satan.” The synagogue of Satan is a fascinating phrase used to identify an infiltration group who masquerade as saved Jews, but they are really of the Devil, unsaved. Galatians 3:29, “And if ye be Christ's, then are ye Abraham's seed, and heirs according to the promise.” The synagogue of Satan was an occult group, who were unsaved and evil. This group today are called Zionists. They control America's newsmedia, Hollywood, the Pentagon and operate secretively through Masonic lodges and other occults groups. The true powers at work in Washington D.C. are hidden, operating from behind the scenes, names you'll never hear on the evening news. There are numerous Councils of 13, Councils of 6, Councils of this, and Councils of that, who are all part of the hierarchy of the Illuminati pyramid of power. Truth is stranger than fiction. So The Great Whore will likely be the Illuminati power structure. Notice that the whore rides the Beast in Revelation 17:3, that is, the Illuminati controls the Beast. Revelation 17:18: “And the woman which thou sawest is that great city, which reigneth over the kings of the earth.” That city is Jerusalem, whose Zionist leaders control America's military and everything else too. Their money has made them kings of the earth. Who do you think was behind the Iraqi invasion? Israel of course. And now they want Iran, Syria and other neighboring countries as well in the Middle East. World War III is building up slowly, but surely, and the Lord's return cannot be far away. Once the Rapture happens, then the Antichrist will be revealed and he will initiate a peace agreement between the Muslims and Jews, freeing the Temple Mount in Jerusalem for the next temple to be rebuilt. Tragically, Catholics dishonor the blessed virgin, portraying her as a religious icon to be adored and idolized. Catholics DO worship Mary! Whereas God said don't give glory to her; Catholic give glory to her. Whereas God said don't bow to statues of her; Catholics bow to statues of her. Whereas the Bible doesn't uplift Mary in any way; Catholics uplift her in every way. Furthermore, the Bible condemns vain repetitions in Matthew 6:7, "But when ye pray, use not vain repetitions, as the heathen do: for they think that they shall be heard for their much speaking." If you've ever watched or listened to a group of nuns chanting the Rosary, it is reminiscent of a funeral home. There is no joy, only empty religious formalism. Catholicism is a prisonhouse of religion! Catholics have churchianity without Christianity. From the cradle to the casket, the Catholic Church has a religious package for you; but they will lead you into the eternal fires of Hell. Jesus' mother was not a whore; but the Catholic religion has turned her into an idolatrous object of worship, causing billions of victims to commit spiritual adultery with The Great Whore of false religion. The Catholic portrayal of Mary is as distant, unrealistic and unscriptural as can be! The very suggestion that Mary lived as a "perpetual virgin," never married and never had any other children is preposterous. The notion that Mary was born without a sin-nature and never sinned one time is absurd. Mary was a sinner, who called Jesus "God my Saviour" (Luke 1:47). In John 5:39 Jesus commanded... SEARCH THE SCRIPTURES! Catholic priests never encourage Catholics to "search" or "study" the Word of God. No, rather, they expect people to believe what they say without question. I beseech you as a friend, please get your King James Bible out and SEARCH THE SCRIPTURES for the truth. You will find, as I have, that the Catholic Church is no church at all; but a cult of self-righteousness and manmade traditions which deny the Christian faith.